The politics of hunger showed it’s desperate face over the weekend. For a few hours, America was treated to a preview of the coming hunger riots when our economy eventually collapses. The Electronic Benefits Transfer (EBT) system allows recipients of government food stamps to purchase goods using a digital card with a set spending limit, but for a few hours over the weekend, that limit disappeared for many users visiting Walmart stores in Louisiana. 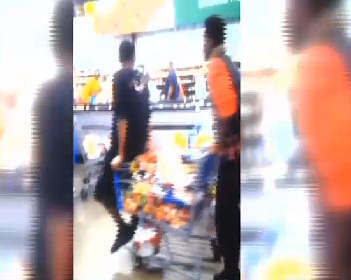 Walmart and local police in Springhill and Mansfield confirmed to CBS affiliate KSLA that officers were called into the stores to help maintain order Saturday as shoppers swept through the aisles at two stores and bought as much as they could carry. Xerox, which hosts some of the infrastructure used by the EBT card system, told KSLA that a power outage during a routine maintenance test caused the temporary glitch. Walmart workers phoned their corporate headquarters to ask how they should handle all the shoppers with unlimited, government-funded spending limits, and were told to keep the registers ringing. Lynd explained the cards weren’t showing limits and they called corporate Walmart, whose spokesman said to let the people use the cards anyway. From 7 to 9 p.m., people were loading up their carts, but when the cards began showing limits again around 9, one woman was detained because she rang up a bill of $700.00 and only had .49 on her card. She was held by police until corporate Walmart said they wouldn’t press charges if she left the food. Lynd says at 9 p.m., when the cards came back online and it was announced over the loud speaker, people just left their carts full of food in the aisles and left. “Just about everything is gone, I’ve never seen it in that condition,” said Mansfield Walmart customer Anthony Fuller. These are Obama’s breadlines. These are the faceless hungry, who through poverty or a feeling of entitlement are only existing on the grace of a government handout. Morals go out the window when many people get hungry – especially if their children are hungry. Violence is one beat away and it walks hand in hand with chaos and anarchy. This weekend was akin to a movie trailer for a grand meltdown and reality bites. The aggression of hunger, fear and the entitlement mentality showed itself for a few hours — I wonder if America even noticed? They better and soon before the golden hordes come knocking.